This wallpaper is aiming for the same effect as Bismuth from Plasma 5.8, but the colours have been turned down from “11”. The development of this wallpaper was a little bit harrowing; I had several designs which were started and scrapped in rapid succession. It’s easy to imagine a few lines in pencil as looking good, but in reality only the initial vector work will tell you if it’ll work. Inkscape for some reason also evolved a rather massive memory leak, swelling to 5+ GB of RAM usage after only a few dozen gradient adjustments, sending my machine grinding to swap. The first part of the making Canopee involves using Envelope or Perspective in Inkscape to set up the initial grid of ‘polygons’, trimming excess, then punching out the unique layers. Unlike Bismuth which had one layer of polygons at varied heights, Canopee had several complete layers of overlapping polygons. The next step is adding gradients and closing the seams. I need to add the gradient first otherwise I can’t see what I’m doing when I close the seams. 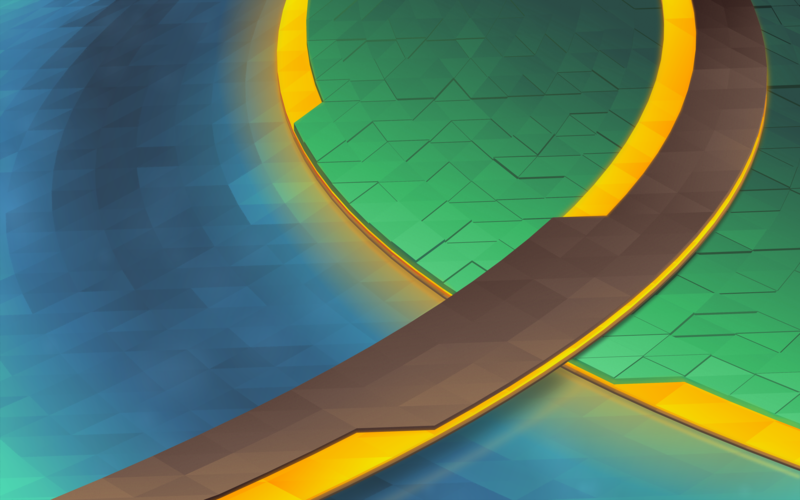 If I don’t close the seams you get those white lines you may have seen in the early 5.2/5.3 wallpapers. Below is after I added the first set of gradients, and the first few rows of “closed seams”. Seams are closed by making every triangle overlap slightly, so I start from the back and manually adjust nodes for every ‘polygon’ in the wallpaper. After getting the water and track done, the next step is the island. You can see that welding the seams makes things more solid. I’ve also made the yellow layers semitransparent, later they’ll glow with a soft light which is accomplished by adding a blurry solid underneath the layers. The “grass” will use vertical jittering to add texture and visual interest. This is actually one of the more time-consuming tasks as it requires huge amounts of manual correction and visual fixes. ‘Polygons’ are more often than not above and below each other when they shouldn’t be, and I have to manually add walls to make them look like columns. This is also the most error-prone part of the process, and some mistakes were caught as late as after adding post-processing in GIMP, meaning several fixes often have to be ‘backported’ to the master vector file. It was also at this point that I decided to dump purple and use exclusively ‘natural’ colours. Finally, I add various fine touches, including reflections, more refined shadows, large glows, particles, etc. At this point everything is set in stone, so I create 3 more layers which will serve as masks in GIMP when I do post-processing. Each mask covers one area which I’ll want to apply a specific effect to; I try to use slur, pick, and thread filters on “liquids”, and noise filters with varying adjustments on other materials. Finally I composite it all in GIMP at a 5120×3200 resolution. This wallpaper had a huge number of corrections in post, including one missed glow, a small run of polygons which were ‘flat’, and several mistakes in the jittered layer. After those corrections the final result is at the top of this post. This wallpaper will be available for Plasma 5.9 at 4K resolutions, but if you can’t wait to get it the top image links to the 2560×1600 version. 2 questions: Can i get this purple proposal? And can you make a 2017 incarnation of this article here? I hope you use KaOS again for this test? Do you use it in your private time as well? KaOS was good, but I try to use systems which are as vanilla as possible for dogfooding purposes and KaOS does ship with tweaks. I figure if I don’t like the way my desktop looks I shouldn’t be allowed to change it if that’s what we’re shipping – I should fix it. Even my phone uses the wallpapers I make for that reason. Right now I’m using KDE Neon. Compliments for Canopee, this wallpaper is to me the most attractive of the 5. * series. Unlike the previous releases, Canopee is less provoking. Thank you for showing the creative process behind this, it is really interesting. Really great work! Love all your work on Plasma5 but the wallpapers are really awesome. I regret to see so often supposed borrowings of a word in French when it is actually amputated of its accents. Removing these accents in French is like changing letters: The pronunciation and the meaning of the word change. The term correctly spelled here is “canopée”. Please do send in the source image too so folks can move layers around etc. wow, thanks for the work! Really nice, for sure you are always creative! Next Next post: Wallpaper, Wallpapers, Website!